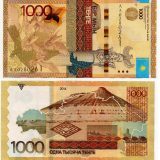 Date of issue: 16 December 1997. 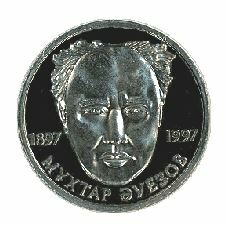 Muhtar Omarkhanovich Auezov is the great kazakh writer. 4-volumes novel-epopee “Road of Abai” translated to many languages brought world frame to him. M.O. Auezov was dramatist, critic, novelist, scientist, specialist in study of literature. The year 1997 was declared by UNESCO as the year of M.O. Auezov. 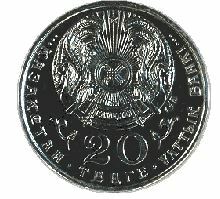 Averse: State Emblem of Kazakhstan against ornamental background; face value of the coin “20 TENGE”; legend in Kazakh. 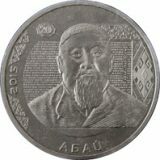 Reverse: the full face portrait of Muhtar Auezov; “1897” means the date of birth of the writer, “1997” means the year of coinage; name of the coin in Kazakh “MUHTAR AUEZOV”.